You’ve probably noticed by now that as your children’s toy collection grows, your livable space shrinks. It doesn’t matter how big your living space is. Even if you do your best to keep things tidy and curate their toy collection, it can be difficult to get rid of THAT thing Grandma bought that she just has to drag out for the children to play with every time she visits. You aren’t the first parent to face this problem. In fact one parent (an industrial designer with a specialization in foldable designs), Ori Mishkal decided to do something about the toy chaos problem. Ori created a new concept of foldable toys, toys that can pop-up in the living room for playtime and fold out of sight when it’s over. in a matter of seconds, his tiny living room turned into a pop-up playground! Oh, and they are 100% eco-friendly too. The reactions were mind-blowing and POPIN™ was founded. Each toy nurtures a different developmental skill for the toddler, tested by pediatricians and hundreds of children. Why is POPIN so cool? First off, there is no assembly needed. All the toys Open/fold in 20 seconds. They are durable and easy to store, with StrongFold™ folding technology, allowing foldability and high durability. Finally, they have a low environmental impact – made from 100% recycled cardboard and they can be fully recycled at the end of the use. Regardless of whether you are a first-time parent looking to start your child’s toy collection, needing to simplify your children’s existing collection, or looking for something you can give your in-laws strong hints that the “children” might want, POPIN is the perfect option to turn tight livable spaces into a playground of fun… and back again in seconds. Click here to visit the POPIN Kickstarter Campaign! Click here to visit POPIN’s website. Click here to Like POPIN on Facebook. Click here to Follow POPIN on Instagram. Click here to Follow POPIN on Pinterest. Click here to Follow POPIN on YouTube. 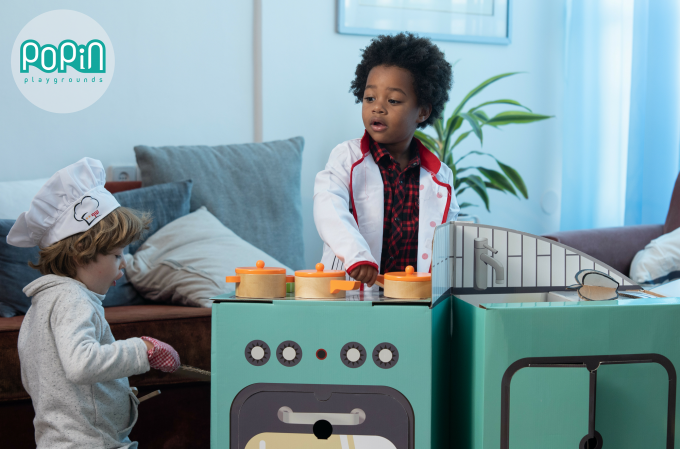 WIN: 24/7 Moms and POPIN are giving away a POPIN Play Kitchen to 1 lucky winner! US entries only and one entry per person. Winner will be chosen on April 27, 2019. Disclaimer: I have teamed up with POPIN in support of this campaign. We received compensation for participation in this campaign. However, all thoughts and opinions are my own.